After 132 years, my old high school is shutting down. Due to declining enrollment, the Indianapolis school board is consolidating seven local high schools into four. 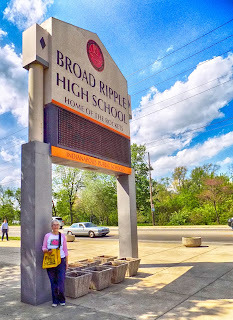 If it doesn’t become a charter school for at-risk kids (which appears unlikely), good old Broad Ripple High will probably be turned into condos like my old grade school was, a few blocks away. (Get your 1BR 1.5bath School 80 condo for only $135,000 today!) The buildings are in great shape and the area is bustling with shops, bars, and restaurants, so the board should get $7-8 million from the sale. Famous graduates include TV’s Dave Letterman (’65), Second Lady under Bush 41 Marilyn Quayle (’67), and Cleveland Cavaliers point guard George Hill (‘04). We joined a tour group of ‘66 (a little before my time) grads until the talk of bad knees, malpracticing doctors, Zoloft vs. Prozac, and evil HMOs got to be a little depressing, so we struck off on our own. I was able to show John the door I used to sneak out of to go sit in my car when I should’ve been in French class, the choir classroom where we rehearsed for Christmas shows, and especially the auditorium where some very talented students put on South Pacific and The Music Man (where I was on makeup duty) and the annual Ripples, student-written and student-produced skits (where I made costumes and hung out in some crowd scenes). Outside the auditorium, now named for beloved music director Gene Poston, hang some wonderful paintings--there’s one by Edward Hopper--gifts from classes gone by. The tile on the stairs in the newest section looked familiar--did they keep the floors and build new walls around them?--but I noticed something missing throughout the complex--there were no clocks. At one time analog clocks dotted the hallways--I think there was one above every classroom door. All you had to do was look up to see what time it was. There’s no need for them in today’s digital age, of course, but I missed them, nonetheless. Would my sister Louisa (’68) recognize more than I did? I think even my niece Miranda (’89 valedictorian) would have trouble--there’ve been two more renovations since she graduated. P.S. John’s old high school, Northwest, is one of the three being closed, too, but in a different way--it’s being turned into a middle school. Go Pioneers!